I've posted this same query at the Altec Users forum, but received no interest, so I'm hoping somebody here might have some experience in the direction I want to take with this build. Here we go. - A Pair of 416-8Z woofers in near perfect condition, one of which has just returned from GPA for a complete recone. - One 802D driver (as new) and one 808-8A driver, unused and fresh from the factory box. Both of these will be refitted with new 8-ohm diaphragms from GPA. The cabinets will be furniture-grade 7 cubic foot pieces with the usual over-bracing, yadda, yadda, designed from computer program and vented. Loosely based on the Altec Model 19. Narrow cabinet width will be compensated by greater height. They will be v-shaped to fit in the corner of the room. - The horns will be mounted on top of the cabinets simply because I want them to be seen. Should I position the woofers at the top of the cabinets as well in order to keep them as close to the horn mouth as possible? (http://web.archive.org/web/200502060...s/HiragaA5.pdf). Complete background article at:http://wajonaudio.webs.com/Voice%20o...%20theatre.pdf. Although Hiraga's crossover is specifically designed for use with the 288 drivers, it seems that the frequency response modifications are identical to those required for smoothing the 802 drivers. I'd appreciate any thoughts you guys have on this project, especially the crossover question. Thanks in advance for any help. Love the car in your avatar! Thanks so much for the input. The crossover design is my prime concern. The approach taken by Zilch (albeit with a different brand driver) and by Hiraga, especially, is to tame the Altec driver's renown mid frequency accentuation by designing a shelving network that will level the 500-5000 Hz output (by as much as 12dB attentuation!). I've heard these components (416/802/511b) using the stock Altec networks, and while they sound fine in a large auditorium, the midrange punch is just too much for a smaller room. I've considered simply biamping this system and using a digital RTA to smooth the output, but testimonials from some posters who have taken the RTA route report mixed results. Seems that more satisfactory results are obtained using a more traditional crossover network with the smoothing done there. A reasonable starting point for your "custom network" would be to mate the LC values detailed in the N809-8A, to the mid-range suppression circuitry of the 30903/4 network . I suspect that you can leave out the variable L-Pad ( ie; "RV1" ) detailed within the N809 schematic . The Zobel components of 30904 ( consisting of C-2 & R-3 ) , should most likely use 18 uF & 7.5 ohm as values ( then they match the 1209-8A zobel values ) . PS; You'll need to accept that you are now making a custom network without having the necessary knowledge that could enable you to get it right " the first time" . You'll need to commit to employing some trial & error . As such, you should order a UMIK-1 test mic for $75.00 , download REW ( Room EQ Wizard ) test software and then learn how to use them together ( then you can see changes in Frequency response that will happen when altering the LC values of the the suggested networks ) . Should you want to try a lower crossover point, here's the basic schematic ( though polarity of the horn might need to be flipped ) . Wow, thanks so much Earl, Lee, and Ed for your valuable input. 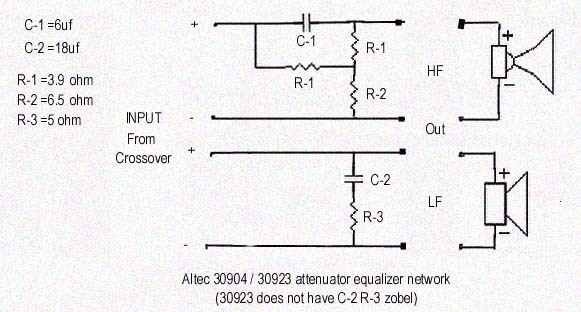 I'd completely forgotten about the Altec 30903/4 network, even though I have it in my collection of notes. Thanks especially to Earl for taking time not only to respond, but in furnishing the schematics. My copies are far less clear than yours. You guys don't know how much it means to me to get this valuable info. Thanks again for making my day today. And a most happy new year to you all. Generally, Altecs 416 series of woofers are known to work best ( for extended LF ) within @ 9 cu' cabinets, tuned to @ 30hz . Also, one wants to build with ( fairly ) closely matched woofers ( to avoid having to make custom crossovers for each side ) . Since you have a recent recone from GPA, you might want to check it's DCR ( using a multi-meter ) and compare it to that of your unmolested 416-8Z. Some of GPA's newer recones may represent be a departure from the older spec. of your 416-8Z. Here's an example of a slightly changed spec; GPA's re-release of the Altec 416-8B . - The changes indicated within the TS marameters of this spec sheet would have me not wanting to use "one-of-each" flavor ( but instead one type or the other ) . I was at the Stax museum in Memphis in June. The recording room had a nice pair of A7 (Fame Studio in Muscle Shoals also had a very nice vintage set). But at Stax, the control room had a bigger version of the A7. Much bigger. Perhaps four or five times the volume. Most likely for cleaner bass. They were probably modified (enlarged) A5 cabinets. See picture below. Great, interesting pictures, Lee. I've never seen anything like those huge Stax cabinets. (Does not mean much, I know.) Does anybody have any further knowledge about their origin? Obviously, whoever wrote the placard on them was not a tech head! I wonder if the guys at Muscle Shoals had any idea what wonderful service they did themselves by decreasing the port volume on the blue cabs by stuffing the horns in there? Another crossover question, if I may: Eminence offers a two-way crossover (500 or 800Hz) with 18dB attenuation for the horn, and 12dB attenuation on the woofer. (http://www.parts-express.com/eminenc...00-hz--290-630) I know that the extra measure of protection for the 802 drivers offered by the 18dB attenuation would be a good thing. Would there be any drawbacks to using this network followed by the Altec attenuation network on the high pass output? This is simply a what-if question. My inclination at this point is to follow Earl's suggestion to combine the 501 with the attenuation network, and just work from scratch rather than patch. Last point, Earl - I checked the DCR on the two 416s and they were within .1 ohm of each other. Did I luck out? I wouldn't buy the Eminence networks . There's no telling how they will interact with your Altec components . All-n-all, I believe you are best to buy ( via eBay ) a pair of N501-8a's ( if the lower x-over point is where you want to start ) or N801 or N809's ( for the higher 800hz point ) and then add the mid-range suppression circuitry ( 30903/4 ). The two models seem to average $100.00 a piece ( judging from past sales ) . If they don't happen to work with your components they can at least be easily tossed back on the Bay to recapture most of your investment. Making your own is slightly more affordable ( at around $80. to 90. ea ) using components from Parts Express . - Also, ( fwiw ) the values I posted don't really come with a guaranteed certificate of provenance / though these questions of the accuracy of the LC values, could ( & should ) be researched . Love the high end crossover Earl! thanks for the link. 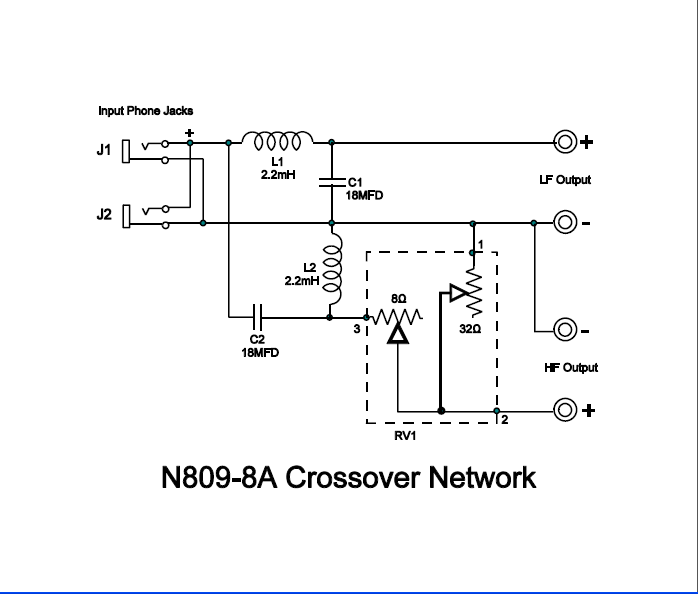 Finally, a crossover schematic that even I can understand! And I think I have all those parts on hand already. I'm set now! 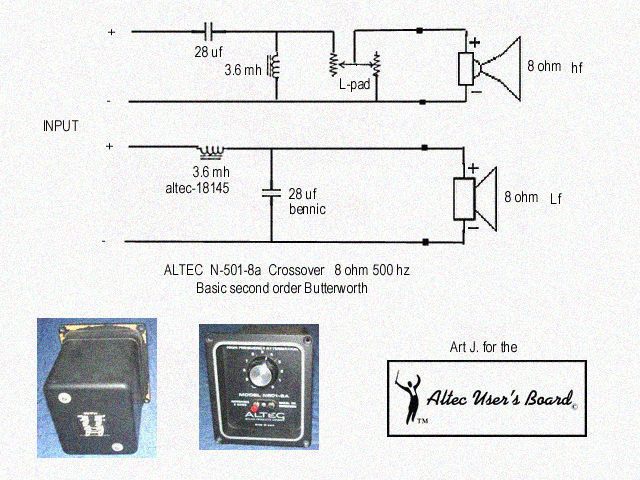 How to build an Altec 604-8G crossover?!? !